This is a knee brace like no other. You just simply need to put it on and immediately it become clear as to why this is the best knee brace you'll ever wear. If you want the ultimate in comfort and support ... then this is it. No need to look elsewhere. The triple locking system allows pressure to be varied in three different areas. 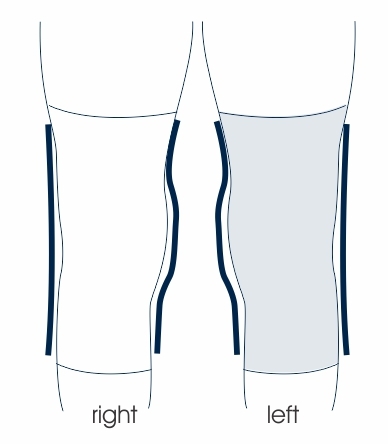 Features two unique C-shaped pressure pads around the knee cap, which when brought together as the brace is secured, surround and stabilize the patella. Dual (2) low profile and super light rods that keep the brace in place. Dual (2) multi-centric molded aluminum hinges (LATERAL and MEDIAL) for improved lateral support in cases of minor instability of the medial and/or lateral collateral ligaments. Inner liner is 100% soft cotton for the perfect soft touch feel. Outer layer made of nylon mesh that forms tiny resistant loops that securely fasten Velcro every time. Natural, hypo-allergenic and breathable materials. These are one of the many unique features exclusive to M-Brace. We lovingly call them 'spaghetti' but there's a good reason for having them. These tension straps made from multiple corded strands work very differently from the common ‘single’ velcro strap. They allow blood to flow more freely under the strap so we don’t get the typical tourniquet effect that most braces deliver. In addition the experience of locking down a brace using these straps feels very different to other supports. The brace hugs the body with a more embracing connection and delivers improved fit and a better overall experience for the patient. Hence the name M-Brace. Super SLIM, lightweight material like no other. Perfect fit and superior comfort. For instability, sub-dislocations and fractures of the patella, femur-patella arthrosis and post op. For passive support during rehabilitation. Provides protection during sporting activities. Apply the brace directly over your knee by following these instructions. You will find two (2) kinds of stays to choose from. One set is a flattened spring for low level support and the second set is a multi-centric molded aluminium hinge. 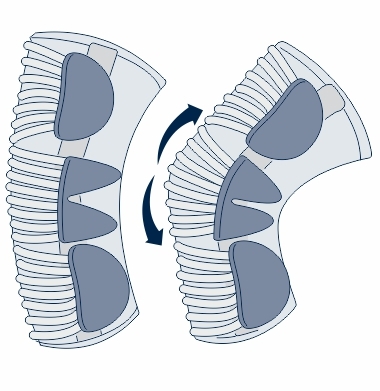 Before application insert your selected stays into their respective pockets on the MEDIAL and LATERAL sides of the brace. Inserting the hinges is made easier by flexing the brace as show below when inserting as seen below. If using the hinges make sure you carefully position the MEDIAL and LATERAL hinges on the correct sides of the knee. See diagram below. The bent hinge is always on the inside of the knee. Finally open the locking system velcro tabs so they are not connected to the brace and pull on the brace over your knee (keeping the label uppermost). 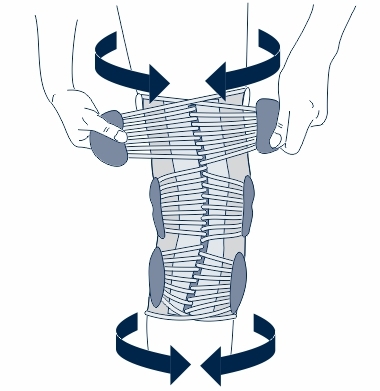 Position so that the pressure pads surround the patella comfortably. Close the three locking straps by pulling both ends of the straps at the same time.